Pages are used to create a navigation structure for your WordPress site, and are primarily used to present content that will not change often. Hover your mouse over the Pages menu option on the left and choose Add New. A new page will be created for you. At the top of the screen, you are prompted to add a Page Title. This value will represent several things: it is the internal name of the page within your admin section; it is the value that is generated as the window title when a visitor comes to the page; and it is the default value that is added as the “permalink” or URL value. The Page Layouts section allows you to change the default layout of your page. The default layout of a page is One Column, but as you will see there are four options to choose from. The Hero Content Area allows you to add either a single banner image to the top of your page, or a photo carousel to the top. Please note that a hero image should be a large resolution image, and the appropriate image(s) should be used here. The standard size for an image in the hero space is 1362x500 pixels. The default Primary Content Area is a Text Block. Most, if not all, of your content will exist within Text Blocks. You can type directly into the Text Block, insert images and embed content. You can add additional content elements to your page by clicking on the Add Page Element button and choosing from a list. These various options will be discussed in further training documents. You can also add additional columnar layouts by clicking on the Add Content Layout button. At the bottom of the page, you can add an additional image by clicking on the Add Lower Content button. This will allow you to add another banner-style (high resolution) image. Continue to add additional pages to your site using the instructions provided above. Once you have added the content to your page, at the top right of your screen you have several options for saving and publishing your page. 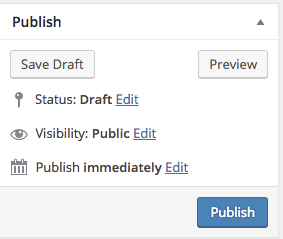 You can save the page as a draft by clicking on the Save Draft button; you can preview what the page will look like by clicking on the Preview button; and you can publish the page for live viewing by clicking on the Publish button.